We teamed up with some of the world's best animal rights photographers to tell the entire story of ducks bred for meat – from the hatchery, to the farms, onto the trucks, and into the slaughterhouse. See and share the footage or photos now. 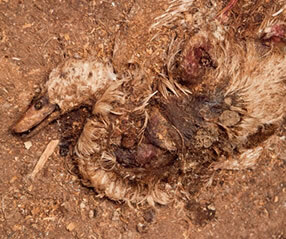 Over 8 million ducks are killed annually in Australia, after living for 6-7 weeks in conditions very similar to those of meat chickens - in crowded sheds with little light, little room, and overall compromised welfare. There is no legal requirement in Australia for commercial duck farms to have water available for ducks to swim, bathe, or even dip their heads. Water deprivation exists in Australian duck farms irrespective of the nature of confinement – intensive (total confinement) or free range (partial confinement). 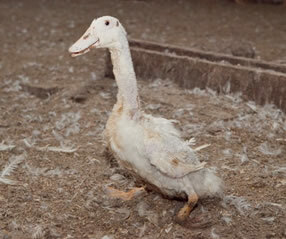 Minimal veterinary input, a lack of vaccines, a build-up of faeces, and a lack of water in which to clean themselves, result in ducks succumbing to a range of diseases, disorders and other injuries, including Salmonelle, E.coli, Pasteurella multocidia, Vitamin A deficiency, blindness, lameness, dislocated joints, broken bones and breast blisters. 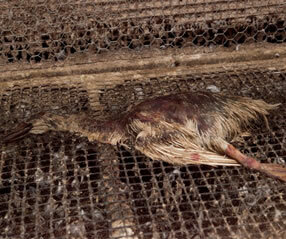 In 2012, one of Australia's largest duck meat producers (Pepe's Ducks) was exposed on ABC's '7:30'. Pepe's Ducks was also fined $400,000 after a complaint made by Animal Liberation to the ACCC. In 2013, Luv-a-Duck were similarly fined for false and deceptive conduct. However, the industry continues to grow at around 5% each year - we need your help. Choose kindly: Widespread cruelty such as this can be changed by our own consumer choices. Together we have the power to change this. Cut out duck from your diet or consider going vegan. © 2019 Animal Liberation NSW. All Rights Reserved.